THE PANTHEON : In search of notable Parisian women, we visited the Pantheon, the Church-turned-Mausoleum-and-Back-and-Forth. 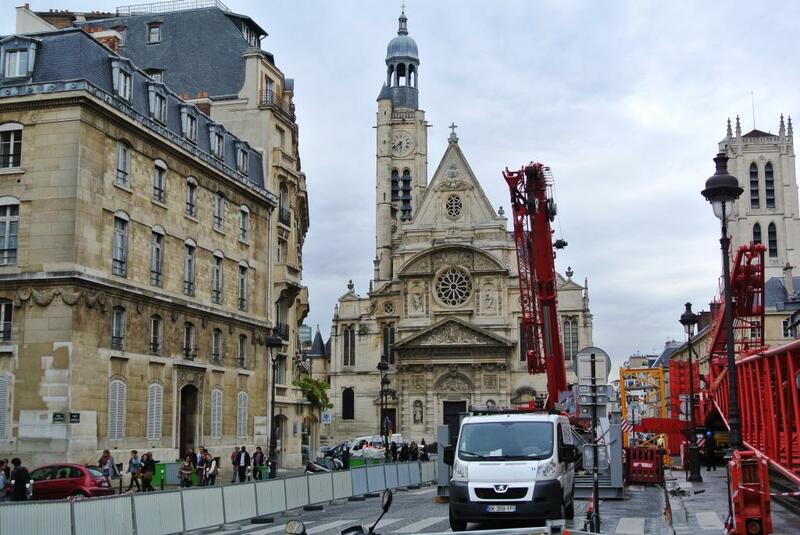 Best to think of it like Westminster Abbey in London: a public space that has religious threads and history. 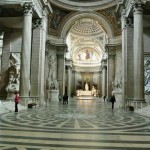 The Pantheon is home of many French luminaries; we were interested in the sarcophagus of Marie Curie and the huge mural paintings about St. Genevieve, the Patron Saint of Paris. MARIE CURIE: Although she died in 1934, she wasn’t interred in the Pantheon until 1995. The guard told us the the enormous underground marble crypt where the luminaries of France are interred closed at 6:00 so we hustled. Almost not fast enough. 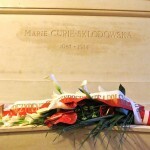 Marie (Sklodowska) Curie won not one, but two, Nobel Prizes. In 1903 she, her husband Pierre, and the French physicist Henri Bequerel were awarded the Nobel Prize in Physics for their work on radioactivity, during the course of which Marie and Pierre discovered the elements polonium and radium. Husband Pierre, considered one of the major players in founding modern Physics, died in 1905 at the early age of 47 from a horse-carriage accident. Marie lived on another 28 years. The practical benefit of the Curies’ research was almost immediate: in the medical field, x-rays could used to improve surgery. In World War I, Marie Curie equipped French ambulances with x-ray equipment and drove them herself to the front lines, and trained doctors and nurses in the use of the equipment. In 1911, Marie won the Nobel Prize in Chemistry for further work in the field of radioactivity . Marie Curie died in 1934, aged 67, from leukemia caused by exposure to radiation. 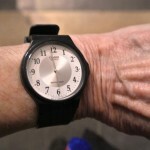 In her day, no one realized the kind of safety precautions necessary to deal with radioactive material. Marie Curie’s life and family illustrate the often close circles of work and marriage in French science. Marie’s brother-in-law, Jacques, was a physicist, and her father- in-law, Eugene, a medical physician. Her daughter Irene won the Nobel Prize for Chemistry, with her husband Frederick Joliot-Curie, for figuring out how to turn her parents’ discovery of natural radioactive elements into artificial ones. Radioactive materials for medicine and scientific research could thereby be created quickly, cheaply, and plentifully. Tragically, Irene also died from leukemia, caused by exposure to radioactive polonium when a capsule of it exploded in her laboratory. Marie Curie’s granddaughter (Irene’s daughter), Helene Joliot, became a noted nuclear physicist. She married a French nuclear physicist Michel Langevin, whose grandfather (Paul Langevin) had had an affair with the widowed Marie. At the time this had caused a scandal in Paris; Paul Langevin had been one of Pierre Curie’s doctoral students and was married at the time. Marie’s grandson, Pierre Joliot-Curie, is a much-awarded biologist. Marie’s other daughter, Eve Curie Labouisse, trained as a concert pianist and later as a journalist Eve married an American and lived in New York, dying in 1987 at the age 102. As a journalist, Eve wrote a long-enduring biography of her grandmother Marie Curie; it was turned into a Hollywood film starring Greer Garson and Walter Pidgeon, and thus Marie Curie became even more renowned, among Americans at least, than before. St. Genevieve, the Patron Saint of Paris, was older than Marie Curie by about 1500 years. Genevieve was considered the patron saint of Paris. A pious, ascetic 5th-century nun from Nanterre, she convinced the Parisians to man-up and not desert their city when Attila threatened it with his Huns in 451 AD. Attila was the one who finally gave up. About 15 years later, another tribe from the east, the Franks, did capture Paris. Genevieve once again stepped forward, this time convincing the conquerors not to starve out the Parisian population. So respected was she by the new rulers that Clovis (Louis), who is considered the founder of the French “nation”, built a church for her. Genevieve was buried there. 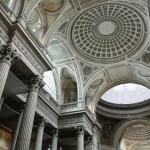 This church was across the street from the present Pantheon, and after a major reconstruction in the 19th century, is one of the national libraries of France, St. Genevieve’s Library (Ste Genevieve Bibliotheque). Fast forward about 1500 years: in the 18th c., King Louis XV fell gravely ill, prayed to her for intercession, and miraculously recovered. In time-honored tradition, the King commissioned a new monument in her honor, and (only) twenty years later, the cornerstone of today’s Pantheon was laid. But the French Revolution, in its divorce of church from state, took over the building, and re-consecrated it as the crypt for the “Great Men” –i.e. Leaders of the Revolution, plus Napoleon. St. Genevieve’s shrine and relics were first transferred to the nearby church St-Etienne-du-Mont, but then in 1793 her poor old bones were put on trial and condemned to public burning, for the crime of participating in “the propagation of error”–i.e., the Catholic religion. Her ashes were cast into the Seine. 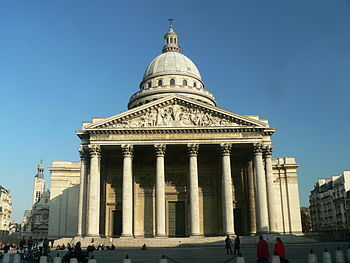 But she got back in to the Pantheon: In the later 19th c., the French state decided it was time for a national reconciliation and regeneration. St. Genevieve and what she represented was a key theme of a huge project of wall murals. The imagery of the murals was supposed to meld French national and religious history, showing that they overlapped and were codependent. The great religious figures of French history were to be depicted – St Genevieve, Joan of Arc, St Denis – as well as those secular like Charlemagne and St Louis who had been important in the making of French history. The mural painters, 40 or so, had the unenviable task of making all the warring political sides of 19th c France happy, the ultra-right who wanted all traces of the French Revolution eradicated and the ultra-left, who were unhappy to have anything related to the Roman Catholic Church exhibited in a public place, at public expense. 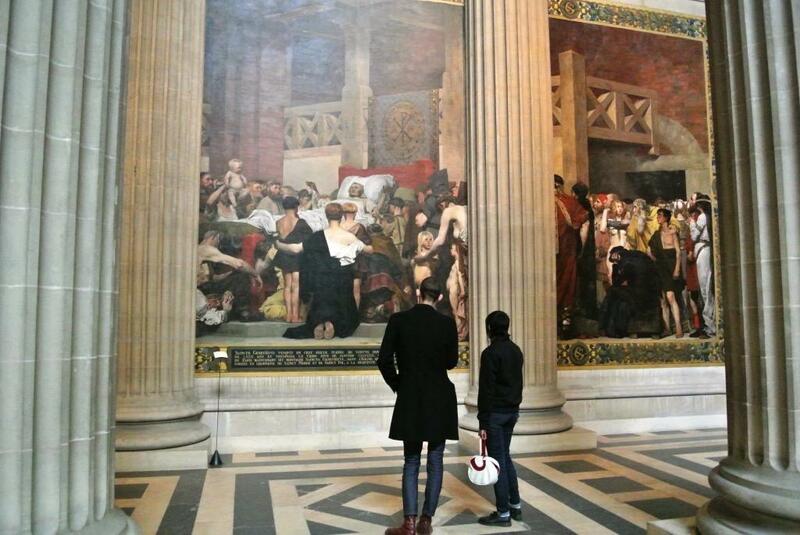 The mural in the photo above is by Jean Paul-Laurens, who ironically held strong republican and anti-Church views. The mural is called “The Death of St. Genevieve”. St. Genevieve on her deathbed, surrounded by the various types of Parisians she had helped, either in her lifetime or through the centuries thereafter, was probably as “safe” a mural topic for the Pantheon as you could find. 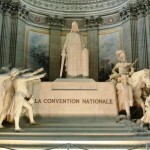 This entry was posted in Architecture, Historical People, History, Paris France, Science and tagged Attila the Hun, Clovis, Emperor Napoleon I, French Revolution, Irene Curie, Jean-Paul Laurens, King Louis XV of France, Louis XV, Marie Curie, Napoleon, Pantheon, Paris, Pierre Curie, polonium, radium, religion, Roman Catholic Church, St. Genevieve, The Franks, The Huns, X-rays on Thursday, July 11, 2013 by Nancy J Padgett.